Initial impressions of David Beattie’s output can cause people to see him as a proponent of Rough Science, a reality television series that drops scientists in out of the way places and makes them complete tasks using locally available materials. For example, take Super collider (2010) and Particle accelerator (2010), works that suggest the products of a poor man’s laboratory and which appeared in Patterns of illumination at Rua Red earlier this year. Composed of the humblest materials – constituents include a ping pong ball, portable record player, bits of copper, brass, plastic and a folded blanket – these kinetic models reference some of the machinery that has helped mankind better understand the structure of matter, the nature of the universe and the complexity of time. Here Beattie links the ordinary to the rarefied in a manner that elicits humour. One easily imagines a deadpan visage of the artist as he strives to playfully subvert physical precepts. Yet the models still perform a didactic function by showing there are various ways of understanding the world. They evoke the ideas of parallel realities and worlds within worlds. In doing so, they spark the imagination and call attention to aspects that cannot, under ordinary circumstance, be seen. David Beattie: A knowledge of things familiar, installation shot, 2011; photo: Adrian Duncan, courtesy Temple Bar Gallery & Studios. In A knowledge of things familiar Beattie again sets out his trademark assortment of ordinary objects and materials to intriguing effect. Among the inclusions we encounter an antenna, a light bulb, CD player, pieces of Styrofoam and some polyurethane foam; their deft deployment begets perceptual uncertainty and raises a host of questions. An austere rectilinear structure also inhabits the space. While laconic titles reinforce the matter-of-factness conveyed by this restrained grouping, an understated humour also makes itself evident. The manner with which Beattie deploys common materials confers a visual richness that also buoys the work. 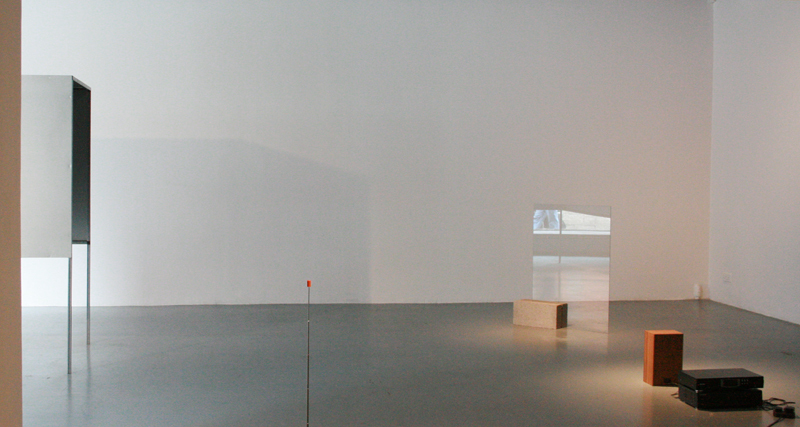 The current U-shaped gallery layout reveals the contents of the exhibition in increments with the illusory Shelter (2011) forming the beginning of the sequence. Perched on its metal legs and visible from the street through the gallery’s mammoth window, this grey, rectilinear box appears to be a closed floating volume. Circumnavigation first reveals the play of light across a satiny surface and shifting tonal values that harmonise with the colour of the floor from some perspectives and contrast with it from others. Then we find that the side furthest from the window and the box’s bottom haven’t been sealed. The volume can be entered, a process which changes our relationship to the structure and the gallery space in general. Not only does this alter the immediate acoustic and visual environment, in part by blocking out much of the street noise and eradicating most of what could be seen, but when we turn round our view has been redirected. The opening frames 18hz (2011), the second work in the chain. David Beattie: 18hz (detail), glass, concrete blocks, speakers, 2011; image courtesy Temple Bar Gallery. 18hz consists of a sheet of glass held upright by a pair of concrete blocks. It is angled toward Shelter and a nearby speaker, which pumps out inaudible sound waves in the title’s frequency. Much of this play of transmission, reception, deflection and reflection resides just outside our perceptive abilities. Failing to detect an expected vibration in the glass, I was drawn to the visual expressiveness of the materials. 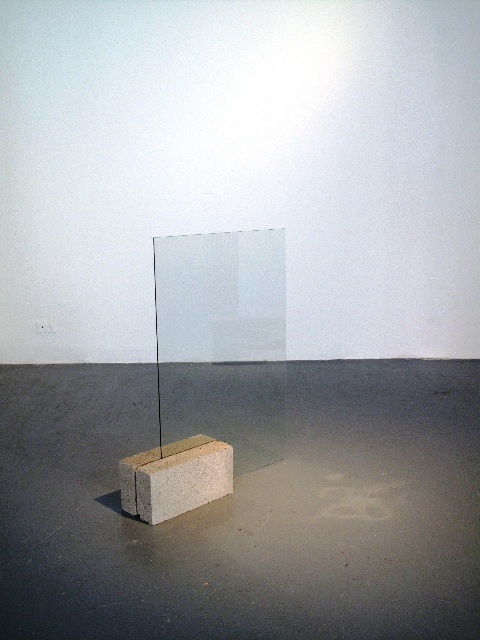 The juxtaposition of glass and concrete recalls Dennis McNulty’s Alternative proposal for Collingwood (Moffet #2) (2010) and its reflective properties harked back to Benoît Maire’s L’objet de singe, négatif (Object for monkey, negative) (2007) shown at Project Arts Centre in 2008. Fearful that I had missed something, crouching next to the floor bound speaker allowed my ears to pick up a faint fluttering noise. I also gradually became aware of an irritating vibration in the floor, the intensity of which varied according to my location in the space. Though I believed the vibration came from some offsite machinery, the gallery attendant contradicted my assumption by noting it derives solely from 18hz’s speaker. The constituents of Antenna (2011) also arouse curiosity regarding the work’s operative potential. Propped up with the help of a C-clamp, this mini-tower intimates a monument to the reception and transmission of radio waves. Nevertheless, its shape and two toned appearance – a copper bolt rests in a silver body – suggest the clamp functions as a circuit that enables the reception of radio waves. 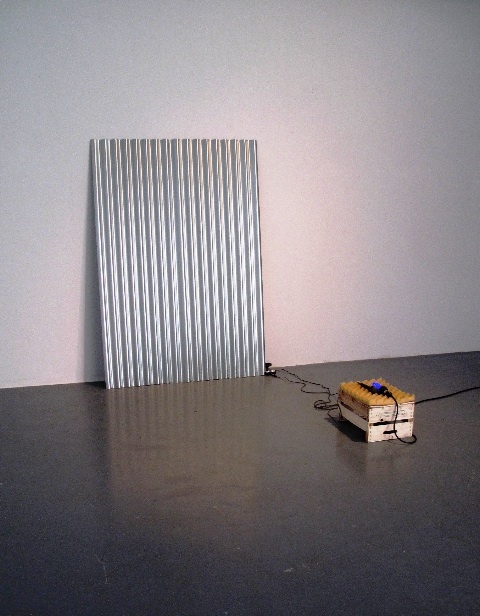 David Beattie: Radiator, UV lamp, microphone, polyurethane foam, wooden box, speaker, tape player, steel, 2011; image courtesy Temple Bar Gallery. Similar feelings couch one’s approach to Radiator (2011), the final work in the presentation. In the fore we see a glowing UV lamp lying next to a microphone on a bed of packing materials. Heat radiates from the lamp, but no sound can be heard. Wires from these two objects trail off to the power supply and a tape player connected to a small speaker emitting a buzzing sound. I wonder, at first, if the speaker plays a recording, but a gentle tap on the microphone proves that it is live. The system is amplifying noise produced by the light bulb. Extending the experience is a sheet of corrugated steel that leans against the wall next to the speaker. This wavy form not only visually amplifies the light bulb’s sound, but its radiator-like appearance also references the heat it emits. Ultimately, the work forces us to consider the title’s multiple meanings. A knowledge of things familiar’s impact arises out of the way it turns the ordinary on its head. It accomplishes this through an intriguing mix of fact and speculation. Encompassing processes that delineate real and prospective occurrences, it lets us tread the borders where science, intuition and superstition meet. It also, by focusing on phenomena that exist at the edges of sensory acquisition, speaks of knowledge’s fragmentary nature as well as the subjectivity and physical abilities that condition perception. Viewers to the exhibition leave the gallery surmising a host of issues. The presentation, for example, urges us to re-examine our understanding of common objects and the ways they function. It puts forth that, in particular situations, they hold the potential to produce extraordinary experiences, the effects of which cannot always be verified scientifically through replication or measurement. By gently disrupting our zones of comfort, the exhibition also asks us to reconsider the meaning of the term ‘familiar.’ Through the production of events that exist outside typical encounters, Beattie’s compositions not only subvert our assumptions, but also show that the ‘familiar’ necessarily embraces inconsistencies. His work encourages viewers to look and listen from various perspectives, to cross reference, circle round and retrace his or her movements. The experience is well worth it. Its residual effects resonate in the mind’s eye long after viewing the show. John Gayer is a writer based in Dublin.